SE trim, Titanium Gray Metallic exterior and Black interior. ONLY 53,706 Miles! EPA 38 MPG Hwy/28 MPG City! Sunroof, CD Player, iPod/MP3 Input, Satellite Radio, OPTION GROUP 02, OPTION GROUP 03. SEE MORE! Child Safety Locks, Electronic Stability Control, Brake Assist, 4-Wheel ABS, Tire Pressure Monitoring System, 4-Wheel Disc Brakes Safety equipment includes Child Safety Locks Hyundai SE with Titanium Gray Metallic exterior and Black interior features a 4 Cylinder Engine with 145 HP at 6500 RPM*. OPTION GROUP 02 Popular Equipment Package, Bluetooth Hands-Free Phone System, voice recognition, Fog Lights, Cloth insert door trim, 4.3" Touchscreen Color Audio Display, Steering Wheel Audio Controls, Sliding Center Armrest, Tires: P205/55/R16, Automatic Headlamp Control, Illuminated Ignition, Driver's One-Touch Auto Up Window, Rearview Camera, Wheel: 16" Alloy, Illuminated Vanity Mirrors w/Extensions, OPTION GROUP 03 Style Package, Leather-Wrapped Steering Wheel & Shift Knob, Chrome belt line molding, Aluminum entrance sills (front doors), Projector headlights w/LED accents, Power Sunroof w/Tilt & Slide. 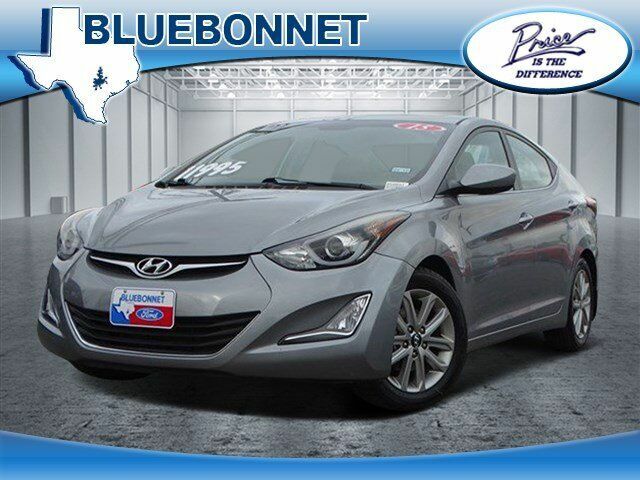 Edmunds.com explains "The Elantra is noticeably quiet at freeway speeds and is indeed one of the quieter cars in its segment in this regard.". Great Gas Mileage: 38 MPG Hwy.